I love mussels as an appetizer or a meal. But invasive, non-native mussels are not good for the waters they invade. Here in Montana, we are doing all we can to keep invasive Quagga mussels from invading our pristine waters. I first discovered this delicious mollusk as I was walking up Kearney Street in Portland OR, past a new Italian restaurant, where a sidewalk table of customers were being served steamed mussels. The aroma was amazing, and the contented look on the customers’ faces led me to another table there, so I could enjoy them too. Mmmm. So whenever I see a new recipe using mussels and wine, my nose is aroused. This recipe is adapted from an article in the Chicago Tribune, by Nick Kindelsperger (1). It serves 2 (as a main course), or more as an appetizer, and takes about 10 minutes for prep and 10 minutes to cook. He does not specify the type of white wine; I prefer a dry white wine such as dry vermouth. The original recipe uses canned, crushed tomatoes, but I prefer to crush fresh tomatoes using a food mill, that separates the desired pulp from the skin and seeds. Separating out the seeds is a good thing because they contain toxic lectins. 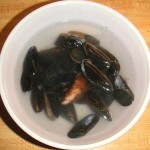 If not using the mussels right away, it is best to brine them; see Live Clams & Mussels: Storage, Brining and Steaming. Large pot such as a saucier, stock pot, etc. 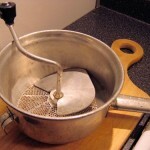 Coarsely chop tomatoes, then crush using a food mill (see photo, above, right). Slice onion, thinly; mince and press garlic and add to onion. Heat olive oil in pot, over medium-low heat. Sauté onion, garlic and salt until onion softens, about 5 minutes. Add red pepper flakes and oregano/marjoram; cook until fragrant, about 30 seconds. Add crushed tomatoes; cook until they have slightly thickened, 3 to 5 minutes. Increase heat to high, and bring mixture to a boil. Add prepped mussels, cover pot and cook, stirring every minute, until all the mussels have opened, 3 to 4 minutes. Discard any that don’t open. Turn off the heat; add the parsley.